Gaming Technology Group, aka GTG, launched a new website for 2015 designed to bring the real life casino experience to the comfort of your home. Euromoon Casino is a vibrant platform that combines both old school and modern iconography and design to engage with the customer. Although the name doesn't appear to be in keeping with the design, the clever image of the Euro cut into the moon really helps identify this domain as a place all its own. The homepage, although having a lot going on and therefore drawing the eye from one area to another, has all its important features in one place, which allows users to navigate with ease. Furthermore, the primary focus is on gaming, which is why the majority of the page is dedicated to Featured Games and its other categories, with the other tabs, such as Promotions and VIP, being listed subtly at the top of the website. As for the games themselves, there is literally something for everyone – from Scratchcards to Live Casino, there is no end of activities to keep you entertained. The full list can be found to the left-hand side of the screen, although there are tabs at the top of the page. The icon of each of the games not only gives you insight into what style of activity you're about to play, but also provides you with a chance to play a demo version or play the real game. Having a demo option is something that is especially useful for newbies as it means they can 'try before they buy', to make sure they really do want to be a Euromoon Casino member. 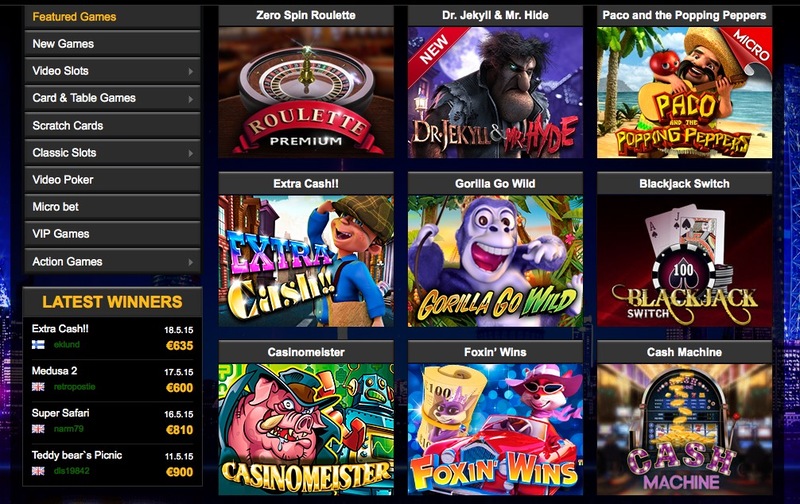 When you select a game you're taken to a new page, however, unlike most websites that only use a small portion of the screen, Euromoon Casino utilises the whole page. What this means, above all else, is that you get an immersive, more enjoyable experience. Moreover, you can choose to 'Play for Real' throughout your demo experience. In addition to being able to see which games are most popular, users are also provided with a list of the most recent winners, stating where they're from, the date of their win, and the final amount they claimed. It's a clever way to demonstrating just how many winners these games produce, therefore encouraging players, new and old, to try their hand one last time.